"What will happen when all the so-called headliners are gone?" 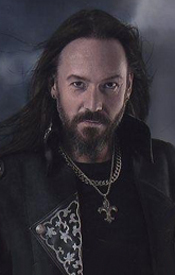 Swedish heavy metal outfit HammerFall has slowly started working on new material and is putting out a 20th anniversary edition of the Legacy Of Kings record on December 7th and as the band visited Skogsröjet festival Metal Covenant took the opportunity to talk with frontman Joacim Cans. Tobbe: You have started working on a new record and what can you tell me about that record so far? 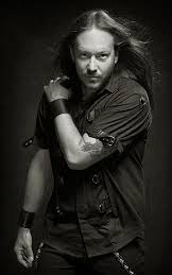 Joacim: Not more, really, than that we have been working side by side with the fact that we have extended the tour, since we went back to the USA for a second time, and we have done some festivals, and we're doing a second run in October and November in the parts of Europe that we didn't do on the first tour. So, you know, I can't say nothing more really, besides that we have come pretty far with it. That doesn't necessarily mean that it's done in any way, because now is the time to tweak stuff and touch things up. 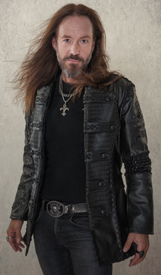 Tobbe: Is it even possible for HammerFall to put out anything but a heavy metal album with some power metal elements? Tobbe: But if the fans would for some reason follow you on the journey, could you deviate a little bit from your path in some way? Joacim: Well, you know, I think the frames of heavy metal aren't so narrow anyway. Metal to me is the whole '80s with everything from glam to Venom and within those frames I move. If we would make a too big step in some direction, it's probably hard to get back from there with our honor intact. Tobbe: We won't talk so much about the next record, since it's not done yet, but you have praised James Michael before and is he involved in some way this time too? 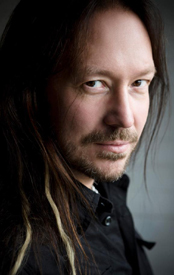 Joacim: Well, he has been my, you know, song producer from Infected  and I have booked him in February again. So, I will fly to L.A. and do all the vocals there, you know. It's so great to have someone who is a singer himself; someone who can push the right buttons and someone who can make me believe in myself in order to step up in the studio. You know, so you're not just there working with someone who can't handle a singer, because then it usually turns out the opposite, you know what I mean? So he has meant a whole lot to me. I trust in what he's saying because he's a singer himself and I look up to him both as a singer, producer and songwriter. Tobbe: And personally, how do you take care of your voice today? Joacim: Well, I try not to talk so much. I never do interviews before a gig. This interview is an exception, but you don't get so much time, for that matter. But I just try to keep going the best I can and I'm not so loud at the parties. Tobbe: Is there something that could beat being a frontman in a band? Joacim: Well, I have never tried something else. To me it's the most natural thing there is. And I wonder how the other guys can get the same kind of kick that I get; how they can attain that. To me that's just impossible. Like some drummers sometimes "I'm behind the drum kit and no one can see me. No light.". No, that wouldn't work out for me. Tobbe: Okay, something that is more on topic right now than the new record: A 20-year anniversary edition of Legacy of Kings is out soon, and what can you tell me about it? Joacim: We found a lot of fun stuff, in the vaults, you know. It's old demo stuff and some live recording with did in Gothenburg with Shure, the microphone company, who sponsored us. And then there's a special interview with the whole lineup on the album. We were all together this time; and that was great. The 5 of us haven't met in the same room for, I think, 19 years. Tobbe: Maybe it's just enough to talk a little bit with each other for a while and I guess getting all the guys back in the band wasn't in question. Joacim: No, absolutely not, because we have an incredibly strong lineup now, and just because we functioned together there and then, there is a reason why they're not with us here and now. But it was great seeing each other again. So, it's going to be a strong edition, with lots of photos and old lyrics sheets that was found, and original and strange versions of songs, you know. And when stuff like this is made, a re-issue, you collect a lot of extra material, it becomes a real treat for the fans that the whole band really was present and stood behind this release even if they're not active in the band anymore. Tobbe: Have you ever thought about making another heavy metal solo album? It's been 14 years since Beyond The Gates was out. So, yes, it came out 14 years ago. But right now I feel no real need to do it. On the other hand I'm open to suggestions about doing something on the side, but I feel it's really nice to be a part of a band where you don't have to be the creative person. That has been rather nice. I'm a bit allergic to projects. I receive a whole lot of requests, but says "No, thank you." to basically everything. There are so many rock operas and stuff, to left and right, and I feel that I don't need that on my resume. Tobbe: But you released some different music a couple of years ago and can you see yourself returning to something outside of heavy metal? Joacim: Yes, but not in the way that I did it there and then. I think I at that point started to look for what I wanted to do. Today I think I would do it dirtier and even more influenced by folk music, and maybe even with some industrial touch, you know. But that's here and now; tomorrow I might say something completely different. I'm really such an emotion human being; I might say yes today and no tomorrow. Tobbe: And how do you look at TV appearances today? You have done some stuff and you're kind of still there. You were kind of a household name for some time in Sweden as well. Joacim: I turned down most offers, because I wanted to, you know, take care of my trademark a little bit. I think it's quite easy to get pulled into it, you know, and then you're sitting there, doing whatever kind of crap for €500 on an invoice. I don't need that. I mean, economy is one thing, but strictly trademark-wise I think I will be better off in the end. I did Stjärnornas Stjärna; I was a member of the jury in one episode, and some other stuff. I did some radio; I was a temp on Rockklassiker. There's no TV stuff in the pipeline right now, but I get some offers now and then, but it's just so hard to make room for it in my schedule. They have asked me to do Doobidoo and Så Ska Det Låta again, but I've been on that show twice already, and that's enough for me, and I haven't done so much new stuff since that, so I feel that I kind of can't bring anything to that show. Tobbe: You did the rock opera Rock Of Ages, like, 5 years ago, and how do you look at doing theatre and musicals today? And to work with all those people; it was great. I didn't go there saying I was the world's greatest actor, because I wasn't even an actor; I was typecasted for this role and I had to prove that I was the right person. Tobbe: On a more personal note, Pontus [Norgren, guitar] has turned 50 and you're next, and is that something you look forward to and is it a milestone to turn 50? Well, it's in two years. But I'm thinking about having the world's greatest party in Florida with my buddy, he and I together, and invite a lot of people. But there's a big risk that I'm on tour then and there's a lot of planning to do; you know, the next record and touring. And we have started to look at the USA again and it's gone really well now, so we will return pretty soon again, and maybe we will have some rescheduling to do. Tobbe: Some musicians see the band as a job and other musicians see the band as a sheer pleasure, and where do you end up in this matter? Joacim: In the beginning it was just a pleasure; something that made me really happy. But the more the business side of it takes over, the harder and the duller it gets, I must say. It's nice to sometimes just go up on stage and bang your head and mosh. But of course, I've done this for a living for the past 21 years, so it's my job. But I do so much else, but it's just so sick that this is what pays the bills. It's definitely a privilege and I should just be so proud and happy that it works. Tobbe: Do you really have any visions in the band nowadays, that you haven't had before? Things that you have already accomplished, you can't accomplish again, you know. Joacim: When we play headliner shows in Europe, we have a pretty good crowd with basically 1500-2500 people coming to the shows. But then you have Maiden up there, who, wherever they go, have their big show. You know, think about it; it would be great to some day be able to do that; to go from one place to another and have the same show wherever you go, and have those trucks coming along. Okay, we have a truck too, but it's just one. So it's a tickling feeling and we would really like to be able to present the band on a larger scale. I think we have it somewhere inside of us and we can handle the situation. And if the songs aren't there, or whatever the reason is, is a completely different thing, but I think we, as a band, have that capacity anyhow. 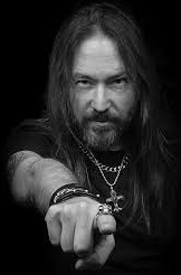 Tobbe: I guess a lot of bands are dreaming about what you mention now, but still, HammerFall has been pretty big almost from your debut album, you know. Joacim: Yes. There's been small ups and downs, but it's never become really big and never down there [Points to the floor], but we have stayed at a very good level; a very healthy level, the way I see it. We have seen many bands come and go, but we go on and do our thing. By the time of the Infected album we had an undeserved drop, I would say. That album cover made it hard for us, unfortunately. I still think that record is so great. Perhaps the drop went a little deeper there. But we have come out of that now and it also feels like the top is about to go even a bit higher. We have put out two records [(r)Evolution  and Built To Last ] that have been really strong, if I may say so myself, and we have done good tours and showed everyone that if we've been valid for 20 years now, then we will be able to stay, as long as we ourselves want to do it, and we have such a loyal fanbase too. Tobbe: The big, old bands won't last forever and Slayer, for example, is out on their farewell tour, and now bands like Avenged Sevenfold and Five Finger Death Punch are coming strong, and will bands like those take over instead of HammerFall, if you know what I mean? Joacim: Well, they have already passed us, I would say. But I don't know how well they go down in the entire world, you know. They're big in the USA, I guess. And those are bands that I don't know so much about, I must say. They stand for another type of metal. But I'll gladly follow their lead; absolutely. But we will see what happens. I think things will be very different in 5 years. What will happen when all the so-called headliners are gone? The sad thing is that they still get the headline slots and then they go on stage and don't deliver, because they don't have it anymore. The question is just for how long we will keep the corpses alive, you know. A lot of bands still deliver of course, but there are a number of examples who don't. Tobbe: And what if you personally end up in that situation? Joacim: Well, I hope I stop doing this before that happens. And it must be fun for me to continue. I have always said that. When it's not fun anymore, then I will do something else. But for now it's just full speed ahead; you only live once.